Ever since January 1845 when Edgar Allan Poe’s epic classic poem “The Raven” was published, writers have been adding tales with a nod to that bird of sorrow. Blackbirds are said to be the harbingers of all manner of bad things. The black bird is an ill omen. 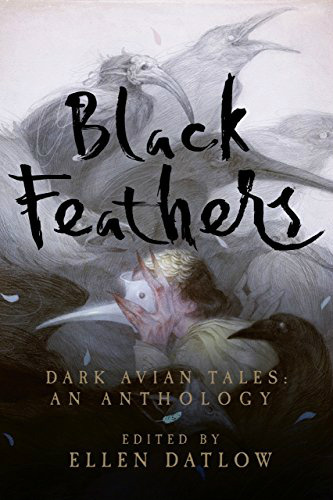 In this anthology, the birds are not all ravens, and indeed, not all real; but they play a significant part in the sad tale of tragedy. The book begins with a poem by Sandra Kasturi entitled “Bird of Woe.” A very fitting beginning to a book that showcases the avian in question! “The Obscure Bird” by Nicholas Royle, a nasty encounter with owl pellets… Not bad at all! “The Mathematical Inevitability of Crows” by Seanan McGuire. Brenda is a strange girl whose name she informs the reader means “Raven.” For her every experience may be tabulated in numbers of crows… This one gets best in book from me! “Something About Birds” by Paul Tremblay is an interview with a William Wheatley concerning his book The Artist Starve. To be honest, I did not like it at all. “Great Blue Heron” by Joyce Hall Oates paints a picture of a heron as a bird of prey that haunts a human who might be called a predator… Never thought about a heron as a praetor; they are majestic! But they do eat living things… I liked this one. “The Season of the Raptors” by Richard Bowes takes place in Greenwich Village, the birds all being birds of prey, even a seagull… Not sure about this one. “The Orphan Bird” by Allison Littlewood deals with a bittern, a bullied child, and a dark secret now that that child has grown up… Truly a dark, black feather! “The Murmurations of Vienna Von Drome” by Jeffery Ford is a series of murders by an alleged “Beast”, a girl with a deformity, another girl with a bird for a companion, and the investigation with weird overtones. I really like this one! “Blyth’s Secret” by Mike O’Driscoll is a dark tale of a man and a bird called Blyth… Sad, but a very good tale! “The Fortune of Sparrows” by Usman T Malik takes place in an orphanage haunted by birds and perhaps even more… Good story! “Pigeon from Hell” by Stephen Graham Jones is the dark tale of a missing boy. I liked the pigeon analogy! “The Secret of Flight” by AC Wise is a play. I do not like trying to read plays. Sorry! “The Crow Palace” by Priya Sharma is… to be honest, I couldn’t make sense of this one.